What is political philosophy? Ronald Beiner makes the case that it is centrally defined by supremely ambitious reflection on the ends of life. We pursue this reflection by exposing ourselves to, and participating in, a perennial dialogue among epic theorists who articulate grand visions of what constitutes the authentic good for human beings. Who are these epic theorists, and what are their strengths and weaknesses? Beiner selects a dozen leading candidates: Arendt, Oakeshott, Strauss, Löwith, Voegelin, Weil, Gadamer, Habermas, Foucault, MacIntyre, Rawls, and Rorty. In each case, he shows both why the political philosophies continue to be intellectually compelling and why they are problematic or can be challenged in various ways. 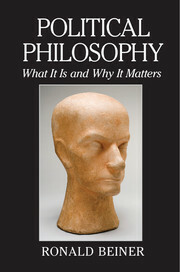 In this sense, Political Philosophy attempts to draw up a balance sheet for political philosophy in the twentieth century, by identifying a canon of towering contributions and reviewing the extent to which they fulfill their intellectual aspirations.